We’d love your help. Let us know what’s wrong with this preview of The Deepest Well by Nadine Burke Harris. A pioneering physician reveals how childhood stress can lead to lifelong health problems, and shows us what we can do to break the cycle. Two-thirds of us have experienced at least one adverse childhood experience, or ACE, such as abuse, neglect, parental substance dependence, or mental illness. Even though these events may have occured long ago, they have the power to haun A pioneering physician reveals how childhood stress can lead to lifelong health problems, and shows us what we can do to break the cycle. Two-thirds of us have experienced at least one adverse childhood experience, or ACE, such as abuse, neglect, parental substance dependence, or mental illness. Even though these events may have occured long ago, they have the power to haunt us long into adulthood, and now we have found that they may even contribute to lifelong illness. Dr. Nadine Burke Harris, the founder/CEO of the Center for Youth Wellness and recipient of the Arnold P. Gold Foundation Humanism in Medicine Award, expands on similar topics as in her popular TED talk as she demystifies the connection between adversity and ill health. After surveying more than 17,000 adult patients, she found that the higher a person’s ACE score, the worse their health. This led Burke Harris to an astonishing breakthrough—childhood stress changes our neural systems and its impact lasts a lifetime. Through vivid storytelling that combines both scientific insight with deeply moving stories about her patients and their families, Burke Harris illuminates her journey of discovery from the academy to her own pediatric practice in San Francisco’s poverty-ridden Bayview Hunters Point. She re-roots the story of childhood trauma and its aftermath in science to help listeners see themselves and others more clearly. To ask other readers questions about The Deepest Well, please sign up. This is one of those rare books I could read in one sitting. Even though the subject matter is sad at times, Dr. Harris's research is compelling. I'm a Licensed Professional Counselor, author, and teacher. I wrote about the ACEs study in my first book (Renewed). Currently I'm in the process of finalizing a book about post-traumatic growth. I spent five years researching and writing about a fascinating phenomenon; one that most people don't know about: That is that some people are resilient to trau This is one of those rare books I could read in one sitting. Currently I'm in the process of finalizing a book about post-traumatic growth. I spent five years researching and writing about a fascinating phenomenon; one that most people don't know about: That is that some people are resilient to trauma and can even thrive after adversity. Trauma can be the springboard that catapults people into higher and better ways of functioning than before. In spite of the pain and suffering, the trauma actually ends up giving some people an advantage in life.  1. Why did some survivors report positive changes when others did not? 2. Can people be helped to find positive changes? What I discovered blew my mind. There are many practical things people can do to heal and grow after trauma affects their lives. You can imagine how interested I was about reading Dr. Harris's research from a physician's standpoint. At times I had to jump up from the chair where I was sitting, and post on Instagram or Goodreads, because I want everyone to know about this book. I will certainly be telling all my friends in my circle of influence. I made a financial donation to the Center for Youth Wellness and hope to support them in other ways. I would like to get this book in the hands of influential people within our governing systems, all the way up to our president. I'm not sure how I could make the that happen, but I will pray, and do my part! Thank you Dr. Harris and staff at the CYW for your dedication and commitment to hurting people. Daknees57 I want to order dozens of copies of Dr. Burke Harris’ book and give to friends, colleagues and community leaders. This book is poorly titled. "The Deepest Well: Healing the Long-Term Effects of Childhood Adversity" explains through storytelling what the ACE studies are and what they represent. Healing long-term effects is not addressed. At all. There is much better information available to read about ACE studies if you are interested, that can easily be found online, without the muddiness of the storytelling format. Although the title is somewhat misleading (the author explains in great detail the adversity itself, not so much how to heal its effects decades later), the book was extremely enlightening and offered me a much deeper insight into the mind-body connection and how our early childhood experiences affect our biology and even our DNA. Our adverse childhood experiences impact our behavior, our ability to learn and our health, with some of the effects showing up much later in life. Studies show that a Although the title is somewhat misleading (the author explains in great detail the adversity itself, not so much how to heal its effects decades later), the book was extremely enlightening and offered me a much deeper insight into the mind-body connection and how our early childhood experiences affect our biology and even our DNA. Our adverse childhood experiences impact our behavior, our ability to learn and our health, with some of the effects showing up much later in life. Studies show that a huge percentage of all the people on Earth have faced at least one toxic stress issue (Adverse Childhood Experience or ACE) and more than 10% have four or more of the possible ten stressors currently defined (Physical abuse, Sexual abuse, Emotional abuse, Physical neglect, Emotional neglect, Intimate partner violence, Mother treated violently, Substance misuse within household, Household mental illness, Parental separation or divorce, Incarcerated household member). ACEs have a dose-response relationship with many health problems. As researchers followed participants over time, they discovered that a person’s cumulative ACEs score has a strong, graded relationship to numerous health, social, and behavioral problems throughout their lifespan, including substance use disorders, auto-immune diseases, risky lifestyle behaviors, asthma, cancer, cardiovascular diseases, fibromyalgia, learning difficulties etc. Compared to an ACE score of zero, having four adverse childhood experiences was associated with a seven-fold (700%) increase in alcoholism, a doubling of risk of being diagnosed with cancer, and a four-fold increase in emphysema; an ACE score above six was associated with a 30-fold (3000%) increase in attempted suicide. Five stars , I guess , for the concept and the fact that this research has helped so many kids over the years . one star for the misleading title : I was expecting more of a work book and tips. There were, I suppose , two of them hidden. 1. The "me me me" style of the writing. Everything is about the author. Her feelings, her fund-raising, her fancy dinner parties. I kept having the urge to say, "Pipe down, I'm trying to read about science!" The real killer for me was when she started to detail her Oscar de la Rente dress. This is a book about the severe and lasting effects of childhood trauma. It is totally tone-deaf to start talking about fancy dresses and high heels. 2. The complete lack of actionable items. The author mentions off-hand a couple of times that things like sleep and exercise are good if you have high ACE scores, which, while I'm sure it's true, is true for essentially all humanity? She doesn't get into the science of why those things work, or give any steps for implementing them if the trauma impairment is making it difficult, which it likely would. Worse, she presents no call to action for what implementing broader ACE treatment would look like - not in policy, or education, or home life. A must-read for anyone who cares about children and the future of our society!! Thanks to Dr. Burke Harris's engaging storytelling, this was a book that I literally could not put down. This is a book everyone should read, but it is not necessarily an easy-read. This brought back much of the pain I still keep tucked away. Most people intuitively understand that unresolved childhood trauma can impact the mind and body of an individual. There's no surprise there. We know about the connection between trauma in childhood and risky behavior, alcoholism, drug addiction, eating disorders in adult life. What we are not aware of is that there is a connection between early life adversity This is a book everyone should read, but it is not necessarily an easy-read. This brought back much of the pain I still keep tucked away. Most people intuitively understand that unresolved childhood trauma can impact the mind and body of an individual. There's no surprise there. We know about the connection between trauma in childhood and risky behavior, alcoholism, drug addiction, eating disorders in adult life. What we are not aware of is that there is a connection between early life adversity and well-known killers like heart diseases or cancer. The impact this can have on health (and other areas) in adult life is frightening. Contradicting Nietzsche ("What doesn't kill you, makes you stronger"), in the case of ACE, they may not immediately kill you, but make the individual physically weak by damaging health in the long run. The relationship between ACEs and poor health outcomes actually means that the higher a person’s ACE score, the greater the risk to his or her health. The diagnosis of toxic stress doesn’t yet exist in the medical literature. Toxic stress has an impact on the child's brain. Children who experience multiple traumatic events (witnessing violence and suffering emotional, physical or sexual abuse), develop stress-response systems that alters from adaptive and lifesaving to maladaptive and health-damaging. The research shows more symptoms a child had, the higher his/her cortisol levels were and the smaller the volume of his/her hippocampus. If an infant does not have a caregiver’s reciprocal eye contact, stimulating facial expressions, snuggles, and kisses, hormonal and neurologic damage can occur, and that can prevent a child from growing and developing normally. Our stress response system is carefully calibrated and highly individualized by both genetics and early experiences. There is a strong connection between childhood abuse and household dysfunction and many leading causes of death in adults like heart diseases and cancer. Higher the ACE score, there is a higher risk in developing autoimmune diseases such as arthritis, lupus or diabetes and even a greater risk of asthma, allergies, migraines, bronchitis, ulcer (this is a long list). Epigenetics are treatable, and the stress response can often be brought back under control through therapy, meditation, and exercise. I found this book quite informative. It explains how adversities during childhood can actually form your mental health, and affect your physical health. if you are looking for a book that goes into great detail about childhood adversities, I highly recommend this. Here's the thing: there's not nearly as much about "healing" as there are about "causes". So the title is misleading. It's the key to understanding your challenges, your parents' challenges, and a brilliant and compassionate insight into how our bodies and brains work - no tear jerking, no pity, no pathologizing anyone. Simply an honest and educational look at how divorce, violence, verbal abuse, and many other stressful parts of our collective childhoods affect how we form attachment, manage stress and self regulate. I want to give this to everyone I know and start a discussion. Harris discusses the long term effects that physical and mental adversity have on all children, the ways to treat it and her advocacy in promoting it and encouraging all physicians to screen for it in all of their young patients by using the ACE test (My Adverse Childhood Experience). I was surprised to read that childhood adversity actually changes a person’s DNA possibly leading to “disease and early death”. Harris does a great job explaining the process without too much technical jargon. Dr. Nadine Burke Harris gives an engaging and moving performance narrating her audiobook The Deepest Well: Healing the Long-Term Effects of Childhood Adversity. Early in the telling, Dr. Harris tells the story of a 43 year-old male, who is the picture of perfect physical health and fitness and who has no other apparent risk factors, having a massive, debilitating stroke then attributes that stroke to adverse childhood experiences (ACEs). I thought to myself, "Yeah, right. What a bunch of BS. 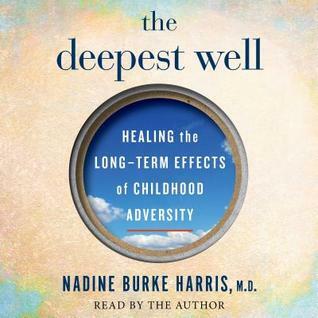 The Dr. Nadine Burke Harris gives an engaging and moving performance narrating her audiobook The Deepest Well: Healing the Long-Term Effects of Childhood Adversity. Early in the telling, Dr. Harris tells the story of a 43 year-old male, who is the picture of perfect physical health and fitness and who has no other apparent risk factors, having a massive, debilitating stroke then attributes that stroke to adverse childhood experiences (ACEs). I thought to myself, "Yeah, right. What a bunch of BS. There's no way she can convince me of this, and I'm not even going to bother listening." I don't know what kept me from ejecting the disc and popping in my new Foo Fighters cd. Maybe it was her smoky, lively voice and heartfelt delivery. Whatever it was, I'm, glad I kept listening. Dr. Harris is clearly a passionate advocate for the healing and good mental health not just of her pediatric patients but of everyone. The Deepest Well is the story of her journey to discovery of the phenomenon of ACEs and how pervasive they are across the entire socio-economic spectrum of society. It chronicles the studies of the early pioneers in the field of its discovery, and the ongoing efforts to develop standardized diagnostic criteria and treatment protocols. I was somewhat disappointed by what Dr. Harris chose to explain in great detail versus what she didn't delve too deeply into. Although she spends a good deal of time explaining, with highly technical medical terms, the neurochemical processes involved in various mental health disorders caused by ACEs, she does not give a single, definitive definition of what ACEs are or a comprehensive list of different types of ACEs. She only briefly discusses current methods of treatment and possible areas of research for more effective future treatment. To be fair, though, she does take pains several times to mention that this whole field is quite young and in need of energetic young practitioners and theorists to begin more fully exploring it with the eventual aim of developing a comprehensive system of diagnosis and treatment and effectively incorporating those into our current healthcare systems. Dr. Harris herself has clearly been an important pioneer in the field and is a passionate advocate for its development. If you've heard about ACEs and are intrigued and want to learn more, The Deepest Well is a good place to start. The printed book may have additional back matter that offers more information about diagnosis, treatment, and ongoing research. If that's the case, I'd rate it 4 stars. But the audiobook lacks additional info so is more of an introduction, albeit an enlightening and engaging one, than an in-depth study. I couldn't put this down. I've been in love with Nadine Burke Harris' work since I stumbled upon her TED talk a few years ago. Although my bias had me set up anticipating I'd enjoy the book, my expectations were also set high. A carefully balanced volume, it weaves tales of childhood adversity with scientific study and stats. Hav I couldn't put this down. A carefully balanced volume, it weaves tales of childhood adversity with scientific study and stats. Having some experience with ACEs studies and stats, it was incredibly interesting to dig deeper and learn more about the human biology of the stress response system and toxic stress. Favorite book of the year so far. ACE's impacts us all and their impacts are astonishing. I talked to my doctor (and my children's doctor) about the work and they had not heard of it...which surprised me and it didn't...i'm going to help spread this gospel. It makes so much sense that childhood adversity can cause health issues in childhood and later in adulthood. I get it. Childhood adversity is a problem that affects children (and later adults) in all walks of life. The ace score will definitely be on my mind as I work with children and their families. Well done! Everyone should read this book. Dr. Harris (who I'd never heard of because I am the only remaining person on the planet who has never listened to a TED talk) shares her learnings from years of research and boots-on-the-ground pediatric-clinic work. In short, experiences of childhood adversity have an outsize effect on your longterm health. Routine screening for number of adverse childhood events (your ACE score) can help physicians and those interested in holistic healing better treat patients. Everyone should read this book. Dr. Harris (who I'd never heard of because I am the only remaining person on the planet who has never listened to a TED talk) shares her learnings from years of research and boots-on-the-ground pediatric-clinic work. In short, experiences of childhood adversity have an outsize effect on your longterm health. Routine screening for number of adverse childhood events (your ACE score) can help physicians and those interested in holistic healing better treat patients. That sounds rather dry, but Harris actually has written a fascinating and moving book. She pleads that her findings not be written off as "poor-people problems," since, as long as all human beings are born of other human beings, we will experience childhood (and adult adversity), no matter our education, income, race, geography. Some demographic groups just hide it better than others. What counts as childhood adversity? To this list, upon which studies have coalesced, Harris added some other factors that are not happy childhood events: foster care; harassment or bullying at school; death of a parent/guardian who lived with the child; primary caregiver deported; life-threatening illness or serious medical procedure; neighborhood violence; discrimination because of any of the usual reasons. No matter your background, getting through childhood unscathed can be challenging. Harris cites a study of 17,000+ middle-class San Diego folks (70% white, 70% educated) - an amazing 67% had at least one category of ACE, and 12.6% had FOUR OR MORE categories. "A person with four or more ACEs was TWICE as likely to develop heart disease and cancer and THREE AND A HALF times as likely to develop chronic obstructive pulmonary disease (COPD) as a person with zero ACEs." And that's just for starters. Dysregulation of the stress response leads to more substance abuse, increased inflammation, allergies, asthma, shorter telomeres (i.e., faster aging), poor impulse control, obesity, learning disability diagnoses, and a shorter lifespan. I give up. DNF at 30%. Fist, the title of this book is misleading. I almost didn't check it out at all because the title made is sound like some kind of new-agey self-help workbook. Our library website provided a more detailed description that implied the book was about the Adverse Childhood Experiences (ACEs) research conducted by Kaiser and the CDC that link long term health conditions and early death with extreme early childhood abuse/neglect. Unfortunately, that wasn't an accurate descriptio I give up. DNF at 30%. Fist, the title of this book is misleading. I almost didn't check it out at all because the title made is sound like some kind of new-agey self-help workbook. Our library website provided a more detailed description that implied the book was about the Adverse Childhood Experiences (ACEs) research conducted by Kaiser and the CDC that link long term health conditions and early death with extreme early childhood abuse/neglect. Unfortunately, that wasn't an accurate description either. I really don't know what this is. I expected science, if not a history of the ACEs studies (there were hundreds of them after the most famous Kaiser-CDC one), then at least an objective and factual synthesis of the pertinent data and some insight into how that data might be used to create public policy or improve healthcare. This book is...memoir? There's barely a sentence in the first 30% that doesn't contain the words I, me, my, mine. A third of the way into the book, and she's just now mentioning the Kaiser-CDC studies and expressing surprise that she didn't know about them. Up to now, she's been talking about herself, her clinic, her past, her clinic's wallpaper, and teasing this surprise connection between her patient's health and environment sound like it's some major epiphany that only she has ever had. The author finally asks why she never heard of the Kaiser studies in med school. A good question. I don't work in any related field, but I've known about them since the early 2000s. For that matter, I remember attending lectures on the subject in my undergrad classes which were prior to the big CDC studies. This didn't fall out of the sky from nowhere in the 2000s, nor did she "discover" it. There has to be a better book on this subject out there. I'm baffled by the high ratings for this one. It's not informative about science and it's not interesting as a memoir. This was a hard book to read, because of the subject matter, but it is so important. I wish I had had the knowledge that I've gained from this book 30 years ago. In some ways it provides some sense of peace, because now I have some idea where certain physical problems that I have may have come from. But it's also frustrating and a bit scary to know that the effects of the stress response may not be done with me yet. This book was a useful and informative exploration of the trauma-related medical research performed by both Harris's team and others, specifically around the effects of Adverse Childhood Experiences (ACEs) on long-term growth and development. ACEs impact childhood development by causing a young person's body to be subjected to an unhealthy amount and duration of stress hormones. Harris shows that recent research identifies that prolonged exposure to stress during critical periods of development g This book was a useful and informative exploration of the trauma-related medical research performed by both Harris's team and others, specifically around the effects of Adverse Childhood Experiences (ACEs) on long-term growth and development. ACEs impact childhood development by causing a young person's body to be subjected to an unhealthy amount and duration of stress hormones. Harris shows that recent research identifies that prolonged exposure to stress during critical periods of development greatly increases one's risk of all sorts of health ailments. To people already used to therapy / self-help type information, nothing will appear as groundbreaking, but it's nice to see that science is gathering hard data on things psychology has been saying for a while. Identifying the biological mechanisms that lead to one's "damage" is worthwhile work. I took a few points down because as a book, it's sort of a mess - it reads partly like a sensational TED talk (the author delivered a relatively famous one on this topic), a shout-out to the author's friends, an autobiography of the author, and then eventually we get to the point of the book - the research and results being done. This book is very easy to read. This is not what makes it good, however it will make it very palatable for who I would have in mind to read it: students in health professions (medical school, public health, etc). Understanding how the experience of childhood trauma (or “adverse events”) is life-shaping has long been important in my field (Psychiatry). For someone who wouldn’t know about what an adverse childhood event is, how influential an event can be down the line, or what to do about it, rea This book is very easy to read. This is not what makes it good, however it will make it very palatable for who I would have in mind to read it: students in health professions (medical school, public health, etc). There's no way I can recommend this book enough. Who do I think should read it? Parents, teachers, medical professionals, social workers, any care giver, and anyone who cares about people and society. Dr. Burke Harris has taken a subject that is heavily based in medicine and made it accessible and interesting for any layperson. Not only does she explain how adverse childhood experiences (ACEs) affect our health and biology, but she also gives us an incredibly personal glimpse into the joys and o There's no way I can recommend this book enough. Who do I think should read it? Parents, teachers, medical professionals, social workers, any care giver, and anyone who cares about people and society. Dr. Burke Harris has taken a subject that is heavily based in medicine and made it accessible and interesting for any layperson. Not only does she explain how adverse childhood experiences (ACEs) affect our health and biology, but she also gives us an incredibly personal glimpse into the joys and obstacles involved in creating a community practice and an organization dedicated to education and healing. Fascinating read. Stressed kids have so much on their plates and no one ever wants to get involved to help them. I know an awful lot of adults who are suffering from stress they had in their childhoods from parent, relatives, classmates, teachers, etc... People, really aren't that nice to each other unless others are watching them. Adults especially, aren't nice to kids if no ones watching. And adults seldom bother to listen, or believe kids, if ask for help. sad state of humanity. It's amazing Fascinating read. Stressed kids have so much on their plates and no one ever wants to get involved to help them. I know an awful lot of adults who are suffering from stress they had in their childhoods from parent, relatives, classmates, teachers, etc... People, really aren't that nice to each other unless others are watching them. Adults especially, aren't nice to kids if no ones watching. And adults seldom bother to listen, or believe kids, if ask for help. sad state of humanity. It's amazing that stress in childhood holds so many more miseries when they become adults. This is an incredibly amazing and useful read on how trauma affects lives young and old. From her creation of the ACES scale (Adverse Childhood Events) to assist in identifying trauma and its extent in children, to her research and real life work putting her recommendations with children that she treated. This is a book for anyone who has experienced trauma, loves someone who has experienced trauma or works with children who have experienced trauma. I can not recommend this book highly enough. A pioneer in the field of medicine, pediatrician Dr. Nadine Burke Harris is a leader in the movement to transform how we respond to early childhood adversity and the resulting toxic stress that dramatically impacts our health and longevity. By exploring the science behind childhood adversity, she offers a new way to understand the adverse events that affect all of us throughout our lifetimes. As t A pioneer in the field of medicine, pediatrician Dr. Nadine Burke Harris is a leader in the movement to transform how we respond to early childhood adversity and the resulting toxic stress that dramatically impacts our health and longevity. By exploring the science behind childhood adversity, she offers a new way to understand the adverse events that affect all of us throughout our lifetimes. As the founder/CEO of the Center for Youth Wellness, she has brought these scientific discoveries and her new approach to audiences at the Mayo Clinic, American Academy of Pediatrics, Google Zeitgeist and Dreamforce. Nadine’s TED Talk, “How childhood trauma affects health across a lifetime,” has been viewed more than 3 million times. Her work has been profiled in the New Yorker, in Paul Tough’s best-selling book, How Children Succeed: Grit, Curiosity, and the Hidden Power of Character, and in Jamie Redford’s feature film, “Resilience”. Dr. Burke Harris’s work has also earned her the Arnold P. Gold Foundation Humanism in Medicine Award presented by the American Academy of Pediatrics and the Heinz Award for the Human Condition. Dr. Burke Harris is writing a book on the issue of Childhood Adversity and Health called the Deepest Well that is expected to be a bestseller and will be released in January 2018.